Take exit 295 off of I-70, go north on highway 77 approx. 8 miles and turn left onto KS-57 (You will see Clem's Convenience Corner on left side of corner and rural water tower on the right) , go 1.2 miles and turn right into the entrance of the Milford State Park. Go through Milford State Park gate and take the first right on blacktop and follow to end. You will see the Southwind Yacht Club docks. Main parking is to the left in main parking lot with limited parking by shelter house on lower level. 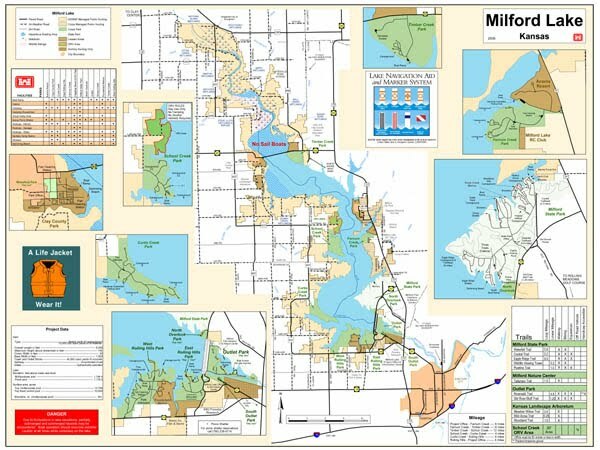 Milford Lake Marina (Also pull out/put in and storage} The Marina is located straight down main road from entrance.